Used RVs are the biggest bang-for-your-buck when buying an RV… right? Maybe, maybe not. It depends. Do it right, and you’ll get a great RV for below market price. Do it wrong, and you’ll get an endless list of problems… and a seller who’s laughing at you, having dumped his ‘lemon’ in your lap. The biggest advantage to buying used travel trailers or motorhomes is depreciation. Somebody else has to pay it! That’s bad enough for the RVer who bought it new. But it’s even worse than that. Depreciation goes on model years, not physical years. RV manufacturers start their model years in the summer – many in June, others in July or August. Units manufactured before the changeover have model years that match the calendar year. Units made after the changeover are “next year’s” models according to the calendar. It’s Already a Year Old! Once the model year changeover occurs, all the RVs on the lot become one year older, and lose 15 percent of their value, even though they’re (physically) still brand-new! RV salesmen know this, of course, but most RVers don’t. That’s why I’m always getting these emails about the “great deal” the buyer thinks he got. The salesman convinces the buyer that 10-12 percent off is a super deal, even though the RV’s value has already fallen by more than that amount! Plus, the buyer could have gotten the coach for an additional 10-40 percent lower anyway, if he or she had known how to do it. But that’s a different story. Even if you manage to avoid the first-year depreciation (which is possible if you know what you’re doing), your new RV will still get hit by an additional 10-20 percent depreciation over the first couple of years you own it. It’s part of owning a new RV, unfortunately. That’s why many RVers prefer to buy used travel trailers and motorhomes. You let the first owner lose all that value to depreciation. Then you come in and scoop up a bargain. That’s the good news. But, like anything else, there’s some bad news too. Unless you’re very careful, you can easily be stuck with a maintenance nightmare. Unfortunately, the RV industry has quality problems. Some manufacturers are worse than others, but all suffer from the nationwide shortage of qualified RV technicians. So even the best manufacturers make an occasional lemon. When you buy new, you’re protected (at least somewhat) by warranties. When you buy used, especially if you buy from a private party, you have no such protection. That’s why it’s imperative to thoroughly inspect a used RV before you buy it. Examine everything. Insist that everything is turned on before you arrive: the water, electrical systems, heating, etc. Test everything and make sure it works, in both hooked up and stand-alone modes. Make sure the slide-outs operate smoothly. If it’s a motorhome, have a mechanic inspect the engine. And so on. 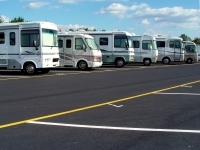 There are two primary sources for used RVs: dealers and private sellers. Private parties are more random. The good news is that some private sellers have no idea what their coaches are actually worth. Or, they might be selling the RV for someone else who’s too sick or elderly to use it anymore. In these situations, you can get some amazing deals. But the opposite is just as likely to be true. An RVer who bought the coach new is often unwilling to acknowledge the depreciation that’s occurred, especially if he/she still owes money on the RV. So he’ll refuse to give you a good deal. So, when looking for used RVs from private sellers, be ready to look at a look of coaches before you find one that’s been maintained well, and where the seller is willing to sell it to you for a great price. If after all this, you wind up buying from a dealer, here’s some info on the RV sales process. Check out this interview I did with a former RV dealer. He explained how to get an RV for close to, or even (in some cases) below, dealer cost.